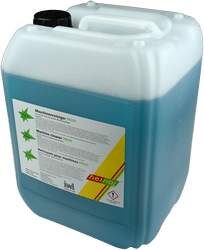 Due to its excellent grease and oil dissolving behavior Heinol Machine Cleaner Profi is particularly suitable for cleaning reflow ovens. For removing condensate Heinol Machine Cleaner Profi must be used undiluted. Since Heinol Machine Cleaner Profi is non-flammable, it can be used on warm surfaces. Heinol Machine Cleaner Profi contains no preservative ingredients, leaving thus on the cleaned surface no residue.